Does Florida’s Climate Matter For Those With COPD? Finding the perfect place to call home is easy for some, but a challenge for people living with Chronic Obstructive Pulmonary Disease. According to the Lung Institute, Florida is ranked as one of the best places to live if you have COPD. Factors such as low pollution, sprawling metropolitan areas and Florida’s Clean Air Act make Florida’s air some of the cleanest you’ll find! How does Florida’s climate affect those living with chronic lung disease? Finding a place with a temperate climate is key when you are living with COPD. It’s no secret Florida is hot during the summer and can worsen symptoms of COPD. On the flip side, you don’t have to worry about the extremely low temperatures that many other parts of the United States face during the winter. Frigid temperatures can cause COPD flare-ups, and the daily chores associated with extreme cold, like shoveling snow and running errands, can be tough for those with COPD. 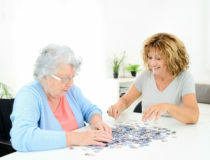 Assisted living communities in Florida recommend staying indoors when the mercury rises to take full advantage of air conditioning. Though the heat can be extreme in the summer, there is a silver lining. In warm temperatures, you don’t need to wear as many layers, reducing lung constriction. Plus, the long, mild winters in Florida allow ample opportunity to open the windows and enjoy the fresh air! Humidity is the accumulation of water vapor in the air. People with COPD often describe the air as feeling “heavy” on humid days. Humidity can cause a couple of issues for those with respiratory disease. First, the water vapor tends to have an adverse effect on overall pulmonary function. Secondly, the moisture promotes mold growth, which is not good for anyone. People living with COPD in Florida can manage humidity levels using a dehumidifier, which makes a huge difference on very humid days. Some also recommend restricting outdoor activities to the morning or night. Despite the humidity, Florida is often praised for its overall air quality, which makes it an excellent choice to live – particularly during the fall and winter seasons – while managing a chronic disease like COPD. If you’re living with COPD, it’s wise to look for locations with low levels of airborne allergens and short allergy seasons. For those who suffer from seasonal respiratory symptoms such as a stuffy nose or congestion, being in a low allergen area is ideal. If you are planning a move, it’s crucial to investigate the pollen counts in the region. Several cities in Florida scored better than average on the Asthma and Allergy Foundation of America’s 2018 Spring Allergy Capitals™ report, which compares 100 American cities! Breathing clean air is vital for those with COPD. Airborne pollution makes it hard for people with COPD to breathe because oxygen gets replaced by pollutants. Not only does this make breathing harder, but it can irritate delicate lung tissue and trigger allergic reactions. If you’re living with COPD, you’ll want to live in an area with low concentrations of nitrogen dioxide, particulates, ozone, and sulfur, all of which are known to exacerbate the symptoms of COPD. In Florida, ozone pollution is declining despite the national trend! According to the American Lung Association’s 2018 State of the Air Report, Cape Coral, Fort Myers, Naples, Gainesville, Lake City, Homosassa Springs, Lakeland, Winter Haven, North Port, Sarasota, Orlando, Deltona, Daytona Beach, Palm Bay, Melbourne, Titusville, Pensacola, Tampa, St. Petersburg and Clearwater ranked as some of the cleanest cities in the nation for short-term particle pollution along with zero unhealthy air days! Cape Coral, Fort Myers, Naples, Homosassa Springs, Lakeland, Winter Haven, North Port, Sarasota, Orlando, Deltona, Daytona Beach, Palm Bay, Melbourne, and Titusville are also ranked among the cleanest cities for year-round particle pollution. Another climate characteristic to consider is altitude. The thin air you’ll find at high altitudes makes it difficult to get the oxygen you need. Lower elevations such as those you find in Florida make breathing easier when you have COPD. 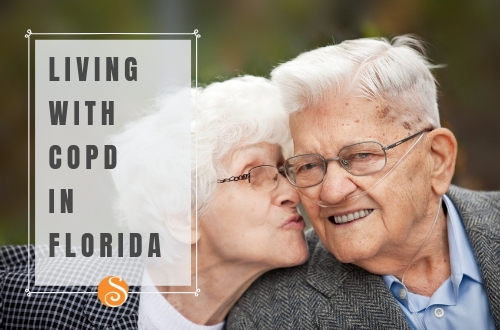 Overall, Florida shines when it comes to providing a good quality of life for those with COPD.